Moving the Needle: Wilson Ramos grounds into a game-ending double play, -.530 WPA. 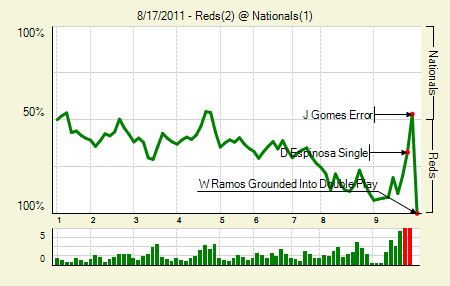 Yes, despite trailing by one, the Nationals had a 53 percent chance of winning the game in the ninth. That’s because they had loaded the bases with one out. But Ramos hit into a 4-6-3 double play, ending the game. Ryan Zimmerman’s leadoff homer went for naught. Ross Detwiler: 6 IP, 7 H, 1 R, 2 BB, 7 K. It’s not the prettiest of starts, but the Nats will take it from the former No. 1 pick. Johnny Cueto: 8 IP, 6 H, 1 R, 0 BB, 5 K. He continues to defy his peripherals, though in this game they were just fine. Moving the Needle: Ian Kinsler breaks the tie with a bases loaded single, +341 WPA. This was a big game for the Angels. They entered the game six games back of Texas in the AL West, having dropped the first two games of the series against them. They got started off right in the third game, scoring twice in the first. But by the sixth the Rangers had tied it. In the eighth Texas loaded the bases with none out, and even though Ervin Santana struck out the next two batters, he couldn’t complete the inning. 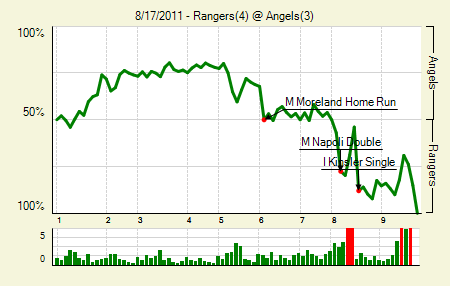 Kinsler’s single to left plated two runs and put the Rangers ahead for good. C.J. Wilson: 7 IP, 5 H, 2 R, 1 BB, 6 K. He allowed just four base runners after the first, and one of them got gunned down while trying to steal. Mike Napoli: 2 for 5, 2 2B. The Angels could use a bat like his to juice up their lineup. 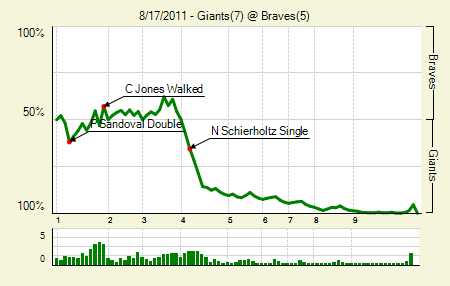 Moving the Needle: Chipper Jones ties the game with an RBI walk in the first, +.103 WPA. The Giants and Braves traded runs in the first, the second of which came when Chipper Jones drew a two-out, bases loaded walk. But that’s all the Braves would get in the first. The Giants rallied for four in the fourth, capitalizing on their own bases loaded situation. Matt Cain: 8 IP, 5 H, 1 R, 1 BB, 9 K. He was probably kicking himself after the game over 1) the bases loaded walk and 2) allowing a hit to the opposing pitcher, even though he was brilliant otherwise. He retired the final 15 men he faced. Pablo Sandoval: 2 for 4, 2 2B. He drove in two runs. The Giants 2-3-4 hitters (Mike Fontenot, Sandoval, and Aubrey Huff) each hit two doubles. Moving the Needle: B.J. Upton’s solo homer extends the Rays lead, +.102 WPA. 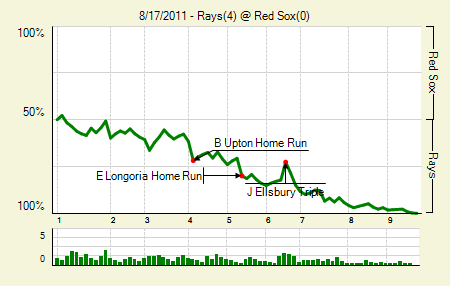 The Rays brought a slow death upon the Red Sox, scoring one run at a time throughout the game. 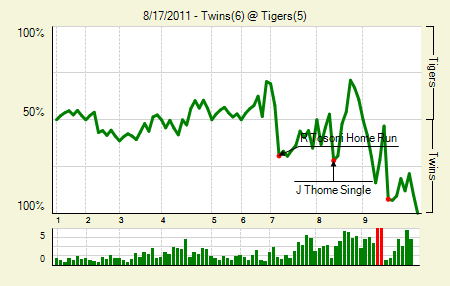 The first one came on a ground out, so the high WPA swing came when Upton homered to lead off the fourth. Tampa Bay did an excellent job against the Boston offense in this series, holding them to five runs in three games. David Price: 8 IP, 3 H, 0 R, 3 BB, 6 K. That’s back-to-back excellent outings, against the two best offenses in baseball. Ben Zobrist: 2 for 4, 2 2B. He drove in two, one on a groundout and one on a double. Moving the Needle: Chris Iannetta caps a huge first inning with a bases-clearing double, +.151 WPA. Ricky Nolasco ran into trouble from the start against the Rockies, allowing three singles and a walk to start the game. He did get two outs among the hits, but he did allow a run, and did load the bases. His poor start came back to bite when Chris Nelson singled home another run, but it really hurt when Iannetta doubled home all the base runners. That made it 5-0. The Marlins made Nolasco wear this one, leaving him in to allow 11 runs in three innings. Carlos Gonzalez: 2 for 3, 1 HR. He drove in four runs. Dexter Fowler: 2 for 5, 1 2B. He scored three times. He’s hitting .315/.399/.488 since the Rockies recalled him in mid-July. He has seven triples in that span, but no homers. 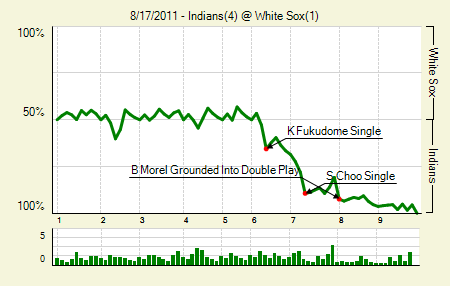 Moving the Needle: Kosuke Fukudome gives the Indians a lead with a single, +.128 WPA. It was so standard, but it meant so much for the Indians chances. With one out in the sixth, Carlos Santana rapped a double to right. Fukudome came up next, and he just grounded a single back up the middle, scoring Santana and giving the Indians a lead. They’d extend it in the next inning and ride it out to victory. Fausto Carmona: 8.1 IP, 4 H, 1 R, 3 BB, 6 K. In his two previous starts against the White Sox he went 8 IP, 18 H, 18 R, 3 BB, 8 K, so this was something of an improvement. Shin-Soo Choo: 3 for 5. That’s his first multi-hit game since coming back. 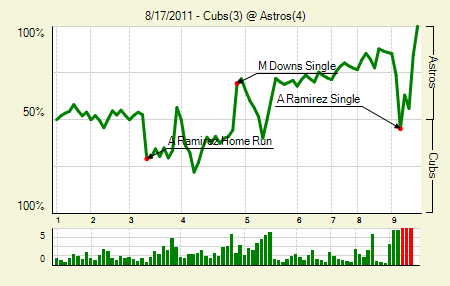 Moving the Needle: Aramis Ramirez gives the Cubs a chance in the ninth, +.287 WPA. Earlier in the game, with Darwin Barney on first, Ramirez homered to put the Cubs ahead. In the ninth they faced the same situation, though this time Ramirez merely singled. Yet that set up the Cubs for a comeback, as it put runners on first and third with none out. But the Cubs could not bring home that tying run. Matt Downs: 2 for 4. Singles, yes, but he had a two-RBI, bases-loaded hit in the fourth that changed the game. Geovany Soto: 2 for 5, 1 HR. The home, a solo shot, was nice, but his ground out in the ninth, which led to the tying run getting cut down at the plate, was the second biggest WPA swing of the game. Moving the Needle: Justin Morneau breaks the tie in the ninth with a bases loaded single, +.391 WPA. The Twins tried to give away their outs, but the Tigers were having none of it. They committed two straight errors on two straight sac bunts, leading to a bases loaded, no outs situation. Two straight strikeouts dampened the mood, but Morneau came through with a grounder up the middle that plated two and gave the Twins a lead. Good thing they got both, too, because the Tigers picked up one in the ninth. Victor Martinez: 3 for 4, 1 2B. He got a rally started that tied the game later. Jim Thome: 2 for 3, 1 HR. His chances aren’t great, but I’d love to see him pass Sosa before the end of the season. Moving the Needle: Jerry Hairston comes through with the bases loaded, +.205 WPA. Lots of bases loaded singles topping the WPA charts today. 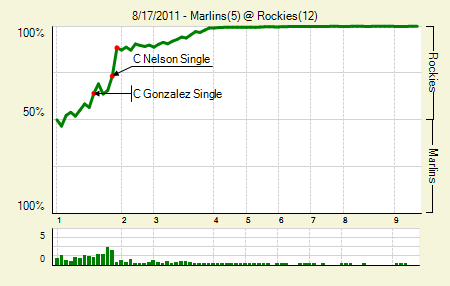 Hairston got his fill in the sixth inning, with the score still tied at zero. That brought home two runners and gave the Brewers all the lead they’d need. They’d pick up an insurance run, after the Dodgers scored one, on a wild pitch the next inning. Jonathan Lucroy: 2 for 3, 1 2B. He scored on the wild pitch. Zack Greinke: 7 IP, 5 H, 1 R, 3 BB, 8 K. That’s his fourth game this season with three walks, yet he still maintains a 2.15 BB/9. Three of those four games have come in his last five starts. 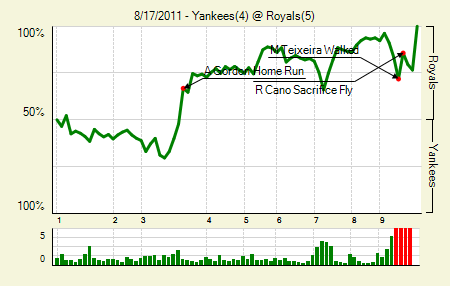 Moving the Needle: Jorge Posada strikes out looking to end the game, -.234 WPA. It had all the makings of a Yankee comeback. Slighted by a homer that wasn’t earlier in the game, they battled back and eventually loaded the bases in the ninth. On the first instance they got a sac fly to pull within one, and then they re-loaded them when Nick Swisher drew a walk. Posada came on to pinch hit, and he stared at three pitches to end the game. Billy Butler: 2 for 3, 1 HR, 1 BB. The homer wasn’t really a homer — apparently the umps botched a grounds rule and awarded him the homer on review. That was the difference. Alex Gordon: 1 for 4, 1 HR. His homer was a no-doubter, though, and it brought home three runs. Moving the Needle: Josh Willingham doubles home a pair with — yep — the bases loaded, +.169 WPA. The Orioles struck with a pair in the top half of the first, but the A’s came right back to load the bases with no outs in the bottom half. Willingham then tied the game with an RBI single, and Brandon Allen’s sac fly put the A’s ahead. 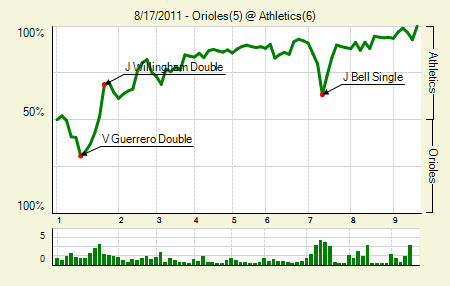 The game ended in strange fashion: with two outs Robert Andino doubled and J.J. Hardy singled. Nick Markakis followed up with a single, but it got past David DeJesus. That caused the Orioles to send Hardy in to score the tying run, but the A’s cut him down at the plate. Game over. Jemile Weeks: 2 for 3, 1 3B. He was also hit by a pitch. Nick Markakis: 3 for 4, 1 2B, 1 HR, 1 BB. It was a great game for him, and it appeared that the misplay on his single in the ninth might have made the difference. Moving the Needle: Paul Goldschmidt homers to put the DBacks ahead in the second, +.176 WPA. He doesn’t play all the time, which is a little baffling given the Diamondbacks’ first base situation. Goldschmidt took advantage of a leadoff walk in the second by belting his third homer of the season (and he’s still under 50 PA). 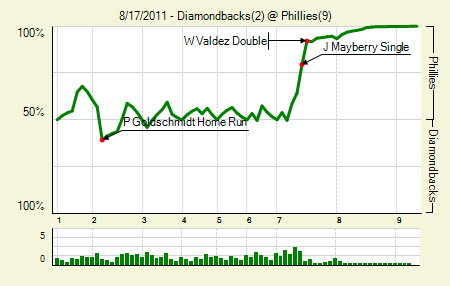 That gave the Diamondbacks a 2-1 lead, though they’d allow the tying run in the next inning. 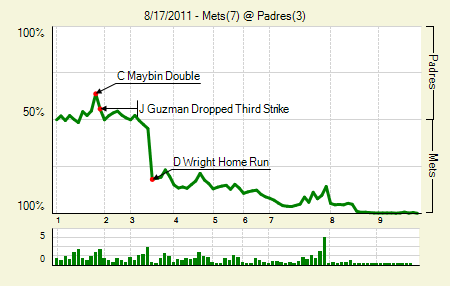 In the seventh it all came undone, though, as the Phillies put three on the board. Hunter Pence: 2 for 2, 1 2B, 2 BB. He scored three times. Jimmy Rollins: 2 for 3, 1 HR. His solo shot got the Phillies started. He drove in two total. Moving the Needle: Adam Lind’s three-run shot puts the Jays up big, +.245 WPA. It was all about the homer for the Jays. They hit three in the first four innings, highlighted by Lind’s three-run shot in the third, to take a 5-0 lead early on. 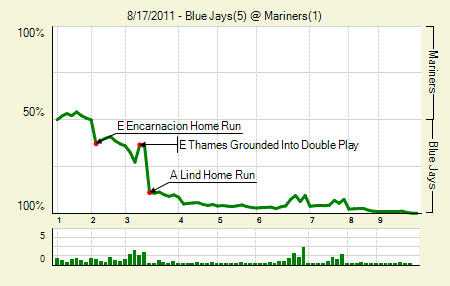 The Mariners never recovered, scoring just once while blowing a bases loaded opportunity in the sixth. That’s Lind’s third homer in his last five games. Brandon Morriw: 6 IP, 3 H, 1 R, 2 BB, 12 K. His nerd stats looked just fine. Moving the Needle: Jose Tabata homers to get the Pirates closer, +.172 WPA. In the fifth, trailing 3-0, the Pirates put the leadoff man on. Two batters later Tabata came to the plate and socked a two-run shot, making the score 3-2. It was Tabata’s first extra base hit since coming off the DL. 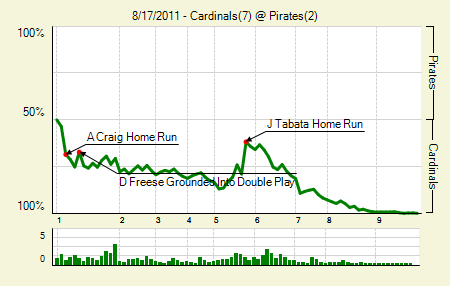 But the Cardinals continued pounding away, and the Pirates did nothing on offense the rest of the game. Allen Craig: 4 for 5, 1 2B, 2 HR. Huge day for Craig, whose two-run shot got the Cardinals started in the first. Kyle Lohse: 7 IP, 5 H, 2 R, 1 BB, 7 K. After hitting a little bump in early July he’s been pretty decent of late. In his last two starts he’s gone 13.1 IP, 9 H, 3 R, 4 BB, 10 K.
Moving the Needle: David Wright’s three run homer gives the Mets a lead in the third, +.272 WPA. For six innings the only runs either team scored came when Wright knocked a three-run shot off of Mat Latos in the third. The Mets would have to wait until the seventh to extend their lead. Dillon Gee: 6.2 IP, 5 H, 1 R, 4 BB, 5 K. His nerd stats didn’t look all that great, but he worked out of a few jams in spite of it. Angel Pagan: 2 for 5. All singles, yes, but he drove in three runs with them. We hoped you liked reading The Morning After: Game Recaps for August 17th by Joe Pawlikowski! Blake Davis pinch ran for Hardy and got cut down at home.